Utagawa Hiroshige (1797-1858) was one of the last great artists in the ukiyo-e tradition. Literally meaning "pictures of the floating world," ukiyo-e was a particular genre of art that flourished between the 17th and 19th centuries and came to characterize the Western world's visual idea of Japan. In many ways images of hedonism, ukiyo-e scenes often represented the bright lights and attractions of Edo (modern-day Tokyo): beautiful women, actors and wrestlers, city life, and spectacular landscapes. Though he captured a variety of subjects, Hiroshige was most famous for landscapes, with a final masterpiece series known as "One Hundred Famous Views of Edo" (1856-1858), which depicted various scenes of the city through the seasons, from bustling shopping streets to splendid cherry orchards. This reprint is made from one of the finest complete original sets of woodblock prints belonging to the Ota Memorial Museum of Art in Tokyo. 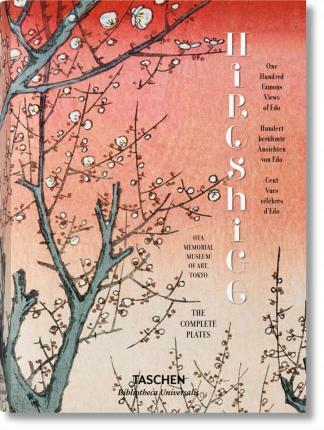 It pairs each of the 120 illustrations with a description, allowing readers to immerse themselves in these beautiful, vibrant vistas that became paradigms of Japonisme and inspired Impressionist, Post-Impressionist and Art Nouveau artists alike, from Vincent van Gogh to James McNeill Whistler. "Dieser Band wirkt durch seine Kombination von Schönheit und Informationsgehalt dem Klischee des Coffee-Table-Buchs entgegen." "This publication transcends the coffee table cliche by combining beauty with information." Before taking her doctorate in Far Eastern art history at the University of Heidelberg, Melanie Trede worked at the Gakushuin University in Tokyo. She was assistant professor at the Institute of Fine Arts at New York University from 1999 to 2004, since which time she has been Professor of Far Eastern art history at the University of Heidelberg. Lorenz Bichler studied Sinology, Japanese studies, and Modern History in Zurich and Beijing. After scholarships at the Waseda and Tokai universities in Japan, he was appointed assistant professor of politics at New York University in 1999. He has held non-established teaching posts at various universities, and given online instruction at the New School of Social Research. He has been a freelance sinologist working in Heidelberg since 2004.